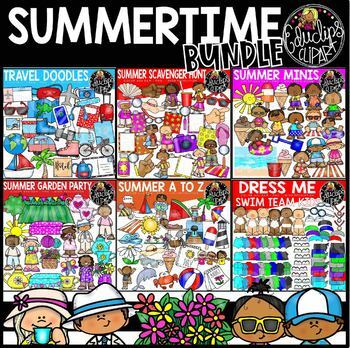 This is a collection of 6 sets of summertime clipart. 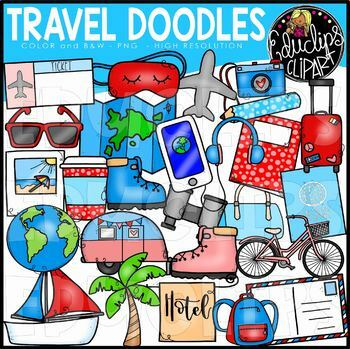 Travel Doodles, Summer Scavenger Hunt, Summer Minis, Summer Garden Party, Summer A to Z, Dress me Swim Team kids. This is a set of your young kids having fun in the sun! Boys and girls in various poses: sitting on towels, sitting on inflatables, with bucket and spade, eating popsicles. The set also that includes a bucket, a spade, sunshine, towel, ocean scene. 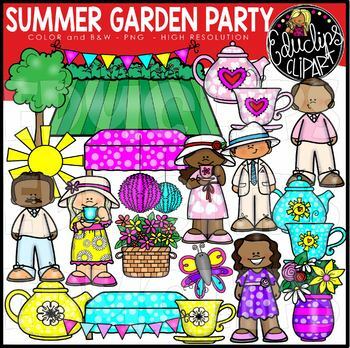 This is a set of images and people enjoying a summertime garden party. The set includes flowers, buntings, butterfly, teacups, teapots, decor, lawn, sunshine, tables, tree, vase of flowers. 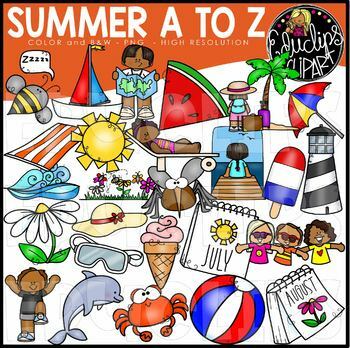 This is a collection of summer images from A to Z. This is a collection of swim team dolls and clothes. The images can of course be used separately but they have been designed to layer over the dolls included in the set so that they can look 'dressed'. ***You will need to use a program such as Powerpoint or similar to resize the images. Please ensure that you know how to resize/manipulate the images before purchasing this product. The images in this set are: dolls (3 boys and 3 girls in different skin colors), goggles, flip-flops, all-in-1 swimsuits, sneakers, swim hats, medals, swim shirt, swim shorts, tracksuit, towels. Each item of clothing comes in black, royal blue, light green, grey, Kelly green, purple, red, sky blue, turquoise.